Xiaomi is undoubtedly one of the most active companies in this year 2016. After having announced the expected Mi Note 2 and Mi Mix, it seems not to be willing to stop, as shown by some images leaked today on the Internet (through the Weibo social network) and showing a new device, the Xiaomi Meri; a mid-range cell phone that will be added to the smartphones recently announced by the company. We already know some data related to its specs, so we take advantage of this leak to tell you more details about it. Although we do not yet have official confirmation from the company, we assume that all launches and presentations are always anticipated by rumors and speculation. Some of the images that we show you at the beginning of the article highlight some considerable changes compared to other models: it has a new design for the antennas, and a front panel that has a very large physical button that must integrate the fingerprint reader. In addition, thanks to the images we have learned that the Helio P10 CPU that we will have in this mid-range phone will include a Mali-T860MP4 GPU, a hardware that should guarantee a good performance at all levels. 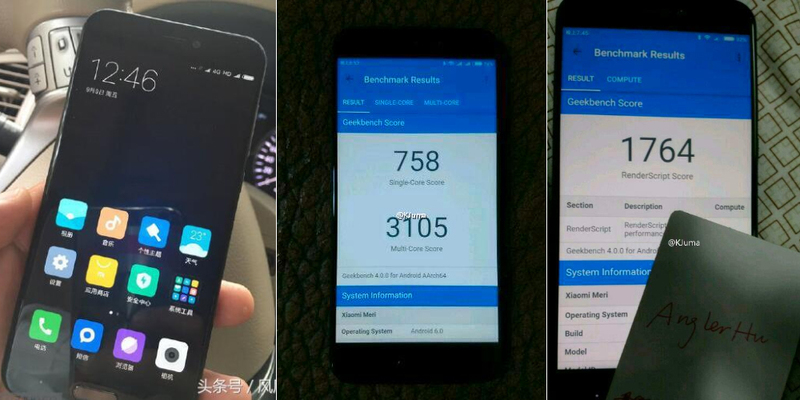 On the other hand, among other rumors leaked, we can also see the results obtained in AnTuTu and Geekbench, known reference sites, and show quite acceptable scores (in the first 63,581 points, in the second reached 1,764 in a single core and 3,105 And 3,043 in multi-core). As for the size, it looks like a device with 5-inch screen (maybe even a little smaller), and therefore intended for that target audience who prefer compact smartphones. The screen also seems to offer good quality, but still the leaked images do not allow a full judgment on this new cell phone. In any case, this Xiaomi Meri should be presented on December 12, in time to be a star within the mid-range of the market (probably for having a more accustomed price to be seen in the low range).